With things having gone so poorly in the last few months, and with so little preparation in the week leading up to the race, it was with some trepidation that I arrived in Worthing on Saturday morning, looking for the start of Centurion’s South Downs Way 50 miler. That soon gave way to mild panic when I realised I’d arrived at the wrong place. Luckily, I managed to reset the sav nav with the right post code this time and 15 minutes later, pulled into the designated car park. Luckily, I’d been in the right town and not driven to the wrong part of the country! Anyway, I dropped my bag, headed over to HQ, and found the kit check queue, and Gary – who is notoriously strict. I felt very smug - I knew I’d got everything, for once. This turned to red faced mortification when I realised I didn’t have a survival blanket – a mandatory piece of kit, the same thing I forgot to take to the SVP100km last year. I remembered getting it out ready to pack, but obviously it never actually made it into my race vest! Luckily, for some reason, there was one in the car so I was good to go without too much trouble, but many thanks to Gary for being patient with me and not giving me any grief. Then I stood in a line to get my race number, except it was the wrong line, and Nici had to show me where to go…Then I realised I hadn’t brought my liability waiver. It seemed it was one of those days where I clearly needed looking after, but where better for that than at a Centurion race – it’s their forte! It was good to get all the mistakes and problems out of the way in the first hour of arriving though, before the race set off, and after these relatively minor issues, everything started to go right. No queue for the toilets, my watch found a signal, I met up with Rosemary, John, Lisa and Ellen before the start :D We had the obligatory group photo, and soon we were running, with little time to worry about what was coming up. It soon became apparent what was coming up – lots and lots of hills! Rosemary and I settled into a pace that suited us both and so we ran together, although up every hill we walked and so it was difficult to get into a decent rhythm. In the first few miles, it felt like everyone else in the race must have been passing us, as other runners sped away up the slopes, but I was determined that I wouldn’t deviate from my tried and tested strategy of going out really slowly, so I could finish strong. Added to that, it takes me so long to warm up, that I couldn’t have run any faster if I’d tried! The first 6 or 7 miles always feel like the worst, when my breathing is all over the place and everything hurts and I feel more like a beached whale than an ultra runner. Luckily, once those first few miles were over, I started enjoying myself. It coincided with some really runnable sections (i.e. not up a steep hill) and Rosie and I were chatting away - it felt very comfortable. The weather was ok, great company, the views were lovely, we came across sheep with their lambs, pigs and piglets, and some particularly fun downhills. All good!! It’s always a little unnerving to think how far you have to go at the beginning of a race, and I didn’t like the fact that due to the nature of the course you could see a stream of runners disappearing miles into the distance ahead of you, but all you can do is just keep going – one foot in front of the other. We got to the first aid station, which looked like a plague of locusts had been through it, so didn’t stop to snack, and pressed on, up more hills, walking whenever there was the vaguest incline! The weather started to draw in, getting colder and windier. Rosie had John crewing for her, but as it was getting chilly, I decided not to stop when we first reached him, and pressed on alone, plugging into my iPod and some music. It’s very different, running solo and I really do enjoy it, but I was pleased I’d been able to share a couple of hours with Rosie. Lindley was also out of the course, crewing for Maxine - I do love having a few familiar faces out there to say hello! So, on I ran, and was making decent time as I started passing people. I was totally warmed up by now, and had been drinking to thirst and eating regularly, so still felt great. I had to rein myself back a couple of times because I wanted to make sure I didn’t blow out my legs early on! As the miles ticked by, the weather started to deteriorate. I’d had my gloves on (and off, and on again) from about 10 miles in, but by 20 odd miles (maybe further, I lose track), the rain came. Out came the waterproof. For the first time, I decided to put my coat on over my pack, rather than faffing about with removing it, and then putting it back on over the top. My jacket was too tight to be honest, over a bigger than usual me, and a pack, but doing it this way was was so much easier! The rain stopped, then started again, the clouds rolled in, and it was grey and pretty miserable for a fair few miles. Other than that first aid station, the checkpoints were all fabulously stocked with every type of food you could possibly want, and I did better than usual at eating on my way round. Good practise for TP100! Watermelon and satsumas, jelly babies, nuts, crisps, sausage rolls, iced cake. Just perfect :D The volunteers at the aid stations, marshals out on course, the other runners’ crew, and friends and family really made up for the weather too. Everyone seemed genuinely friendly and wanted to help (often holding gates open) and cheered us on. At one point I decided I’d had enough of my coat for the time being, but was struggling to put it back in my pack, so just asked a group of people stood by the side of the trail if they could stuff it in one of the pockets. Within seconds my coat was stowed…and very much appreciated the help was too! 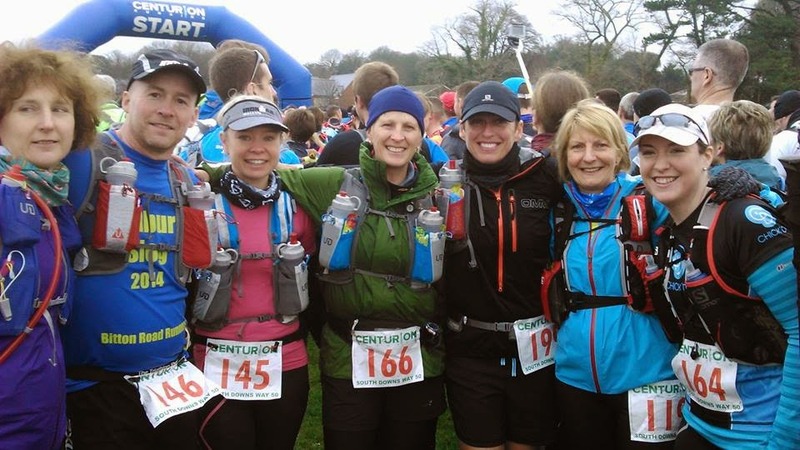 I ran intermittently with others thoughout the day, chatting to a few people – I don’t remember anyone’s names I met on the course, because I’m terrible like that, but particular mention to a guy (who said he read the blog), who was running his first ultra over 30 miles, which he did at the Stort. He looked very strong so am sure he would have finished well! It was great to meet up with Sue too, briefly, who I haven’t seen for ages. She and Joe, her other half, were running really comfortably and I’ll see them both at TP100 as that’s Joe’s next race. Generally though, I ran on my own, with only my thoughts and the iPod in the background for company. For the last few hours of the race, the sun came out, and it was beautiful. The South Downs looked absolutely stunning...I had to stop a few times just to try and take in the views, to try and remember how perfect it looked. From such a high vantage point, looking down across rolling fields and over to the sea on the horizon, with the sun glinting on every surface and illuminating the water, it was like I was stood in a painting. 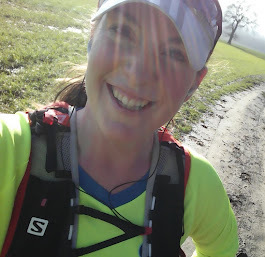 My running (and walking) was going pretty well too – I felt comfortable moving, and just so privileged to be out there, enjoying myself, and doing what I love. I was still going strongly as we went through the last couple of checkpoints and amazingly didn’t have any general aches or pains other than my toes. I realised that I’d absolutely destroyed my feet and was experiencing the most acute, agonising shooting pain as my big toes hit against the front of my shoes when I was running the steeper of the downhills. I ended up adopting a very strange style of curling my toes up tight as I ran, to try and protect them. It got me through, as did the nurofen plus I was very pleased I was carrying with me. I focused on people in front, and ran on to overtake them, marching up hills and taking the gravity advantage down them. I eventually caught up with Amy out on the course, who had been so nervous about her first ultra, but who was doing incredibly well. There was one section where I was playing cat and mouse with a couple of guys on mountain bikes which entertained me – the hills were steep and I kept overtaking them as I hiked up, with them overtaking me when it became more easy to cycle and then disappearing whenever there was a downhill. Eventually, hauling myself up yet another hefty slope, I was greeted by a marshal, who told me that I’d completed the last of the hills, and he pointed me in the direction of the route down to Eastbourne. I was so happy…and it was another spectacular vantage point as the sun started to fall low in the sky…so I stopped again, just for a few seconds to try and take it in. This section of downhill, at about 47 miles, was probably my favourite – through some trees on a technical bit of narrow trail, and despite my odd style of scrunched up toes, I managed to get up a bit of pace, and a couple of guys even stood to one side of the path so I could pass them. I was very grateful as I’m not sure how effectively I could have stopped! 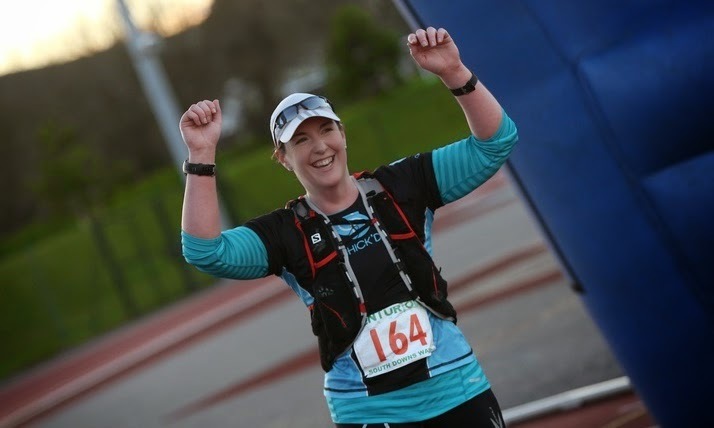 I had to do a lap of the athletics track, and it crossed my mind to try a sprint finish, but decided against that very quickly, finishing at an easy pace, in 10 hours 17 minutes. I was rewarded with a medal presented by Mimi Anderson (what an honour, she’s such an inspiration!) and a very big, very welcome hug from Nici, and then from James – who told me I had 13 minutes until the next coach that would take us back to the start line and our cars, otherwise I’d have to wait an hour. Not wanting to hang around in the cold, I quickly got my bag, my t-shirt, said my hellos and goodbyes to John and Ellen (who had finished in a storming time of 9:41) and trundled over to the coach. The 7:30pm coach!! When I’d been expecting to have to get the 9pm coach!! I’d even emailed Nici earlier in the week to confirm there’d be space on the later one, I was so sure I’d be back after dark, what with all of the hills I was going to have to walk up! So I was very pleased with myself. In fact, I’m in awe of what my body lets me do. With terrible fuelling, little training, and far too much weight to drag around, it performed brilliantly on Saturday and I am very grateful to it! Now, I just need to get myself ready for TP100. My toes are still very sore, although they weren’t as bad as I’d expected when I took my shoes off. Big toe nails were totally black, but once I drained them (MUCH more blood than I’d expected) they have gone back to a relatively normal colour, and are now slowly healing. Just got to wait and see if the nails fall off or not and hopefully can avoid infection. DOMS was manageable post-race too – I was ok on Sunday, a bit more sore on Monday and Tuesday, but totally fine today. Oh, and the winner? He finished in an absolutely astronomical, unbelievable, 5hrs 52mins. An average pace of 7.03min/mile. I can’t run that fast in a 5km! I think he must have caught a lift somewhere ;) The course record (from last year) was 6:11, which is still phenomenal. I can’t begin to imagine how strong you have to be to not only run a 50 miler at that pace, but to maintain that up the mountainous hills!! I am in awe – that's a level of fitness that will no doubt see him breaking course records up and down the country. Chapeau! The women’s race was won in 7:19 – an average pace of 8:46. 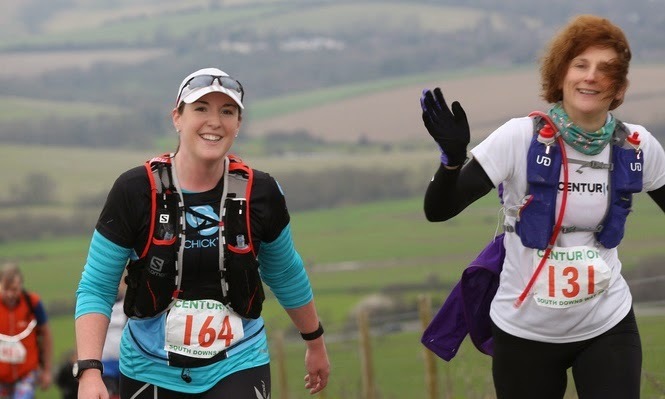 Although this wasn’t a course record, the winner, Sarah Morwood, will go down in the annals of ultra running for the truly lovely act of donating her first lady trophy, to the last lady to finish within cut-off! It was made even more significant I think, by Maxine, who ended up being the last lady, finishing with just 9 SECONDS to go until cut-off and the drama towards the end of the race, as everyone waited to see if she would make it in time, was a truly epic end to a fantastic day.